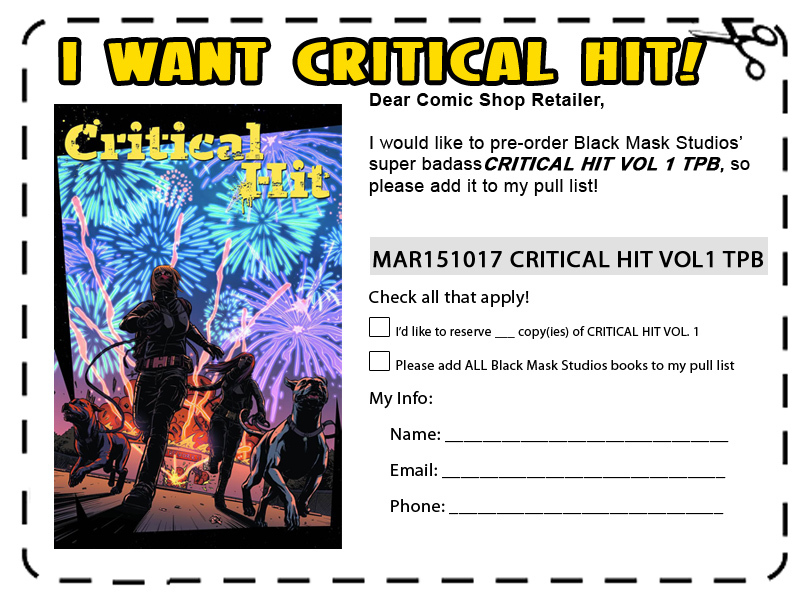 Critical Hit Volume 1 Trade Paperback available for Pre-Order! Volume 1 of CRITICAL HIT, the follow-up to the LIBERATOR series of books, is available to pre-order now! Collects issues 1-4 of the critically acclaimed series and I’m super proud of the CRITICAL HIT team and the work we did on this series. Please print/bring the coupon below to your local comic shop to pre-order or if you don’t have a comic store nearby you can pre-order online here. We much prefer you support your local businesses if you can, though! click to enlarge, print/bring to your local comic store to pre-order! ← Out TOMORROW 2/11: Toe Tag Riot 3, Critical Hit 4!